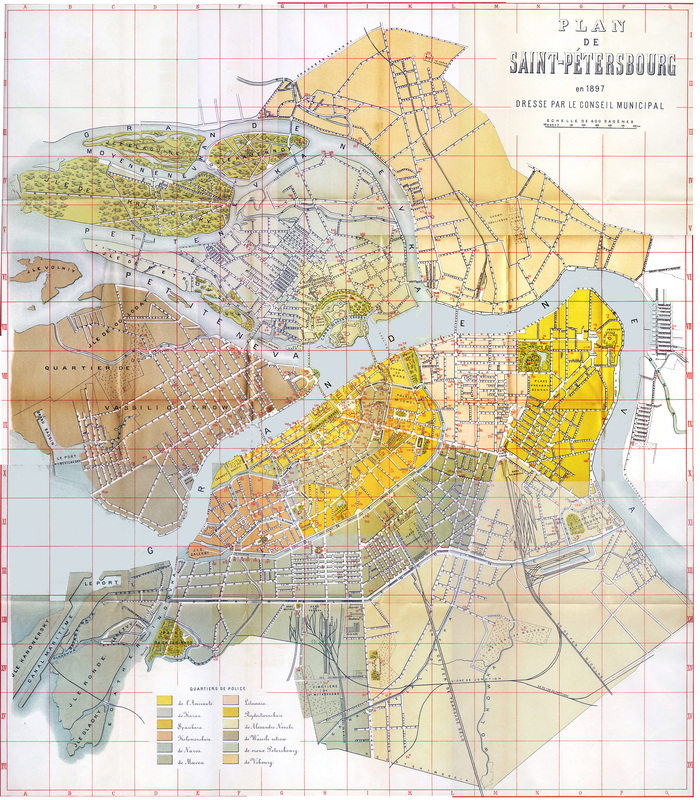 This is a large map of St. Petersburg that was part of the St-Pétersbourg Plan-Guide 1897 (St. Petersburg: Imprimerie P Jablonsky, 1897). I had to scan the map in pieces, since it was larger than my scanner, and then I photo-stitched it all together using Photoshop--that accounts for some of the color variations of different areas of the map and for the fact that some sections of the map do not line up quite exactly. I also added the zoomify feature so that you could zoom in on specific sections of the map. The Guide was published in French, which was the language of much of the Russian upper class at the time, and so all the names on the map are French versions of the Russian names. If you want to see the entire map displayed on a web page--the map is very large--then click on the thumbnail below. This page is copyright © 2009-13, C.T. Evans.